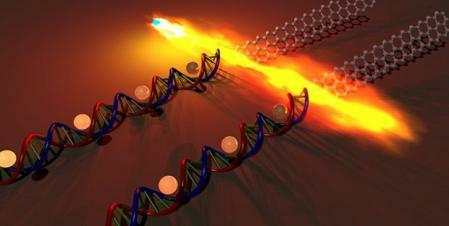 Researchers from Stanford developed a new way to produce graphene ribbons using DNA strands. GNRs have a bandgap and so can be used as building blocks for transistors, and indeed the researchers produced transistors based on GNRs produced using this new process. The process goes like this: it starts with a silicon substrate, dipped in a DNA solution (derived from bacteria). They then combed the DNA strands into relatively straight lines (using a common technique). They exposed the DNA to a copper salt solution which allowed the copper ions to be absorbed into the DNA. The next stage is to heat and release methane gas. The heat starts a chemical reaction that frees the carbon atoms in the DNA and in the methane. These were joined together to form stable graphene ribbons. The researchers explain that the DNA carbon atoms remained close to the DNA strands when the were freed, and so this formed ribbons that followed the DNA structure (i.e. long and thin). Of course there is still a lot of work to be done. Not all ribbons were single-layer as some were multi-layer graphene - or actually graphite ribbons.